Imagine someone used to typing on a typewriter switching over to a computer. How long would it take to soften the blow on the keys? I remember when I reluctantly moved from a Blackberry to a touch phone. We put in a lot of effort in learning skills and getting comfortable with them over a period of time. It is natural to resist unlearning to learn something new and go through the process of finding new comfort. While I did a post on continued learning as a skill during this very challenge, unlearning is equally a skill in today’s times. Unlearning has become all the more critical now when things change at an unprecedented rate. From the way we order groceries to how we stay in touch with people, everything has changed. The use of technology dominates our life and people of all ages need to adapt to it. It is easier for the younger generation since technology is a way of life for them. It is ironic that academics taught in schools and colleges becomes obsolete the moment students step into the real world. They need to unlearn the theories they were taught and relearn how to apply them in practical life. Unlearning and relearning is a part of all our lives now, what with new updates on various technological platforms and devices. It is also important as move through different phases of our life. We are born in a certain environment where we grow up believing in a certain way of life. But as we encounter different situations in life, we need to let go of old systems and recalibrate our thinking. It helps overcome our limiting beliefs and adapt to new situations. If you’ve been at a job for sometime now and look back at when you started, you’ll realise how many times you have unlearnt as eventually newer things took over. Re-skill yourself: With new skills gaining relevance, invest in learning what’s current. Even if you started your career 5 years ago, you must have noticed how things have changed drastically in that short span of time. And acquiring new skills is one of the ways to relearn. Re-skill for the future: The next 5 years are going to see even more rapid rate of change than the last 5. Watch industry trends and anticipate the skills you may need to acquire as they become relevant. Read: One of the easiest ways to learn the latest. Set regular time out to catch up with the latest. There are enough tips on how to do it here and here. Be open the change – It is natural to resist change once we are set in our ways. But being more amenable to it can only work in our favour and help us welcome it instead of being forced into it. 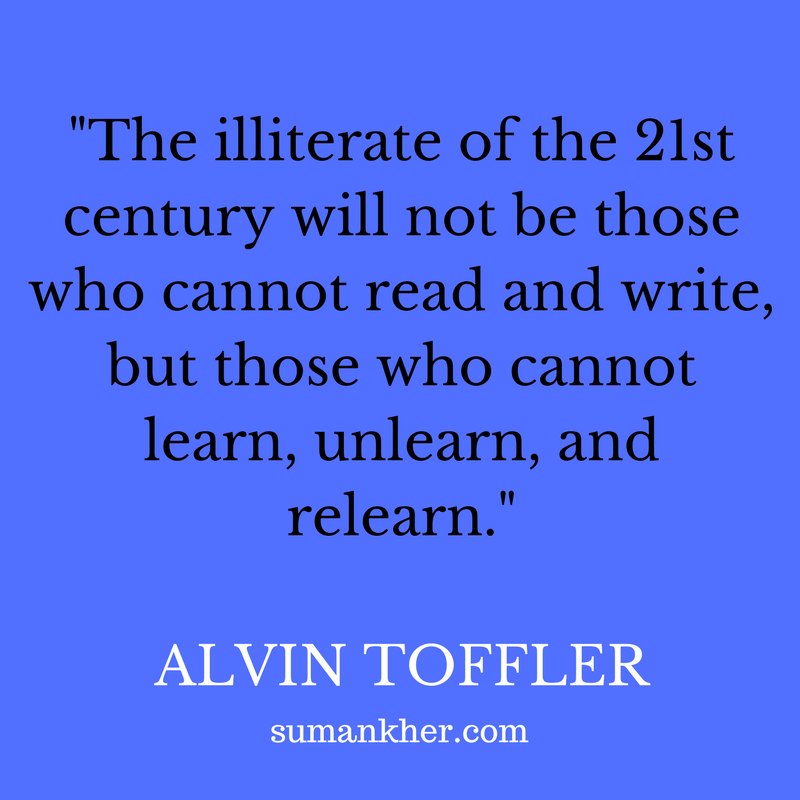 Unlearning is also a kind of learning – learning to adapt to the new. And it no longer seems to be an option. We don’t live in a world where hard work alone can take you places. Smart work is equally important to get ahead. Here’s a great piece on the concept of unlearning and re-learning from Forbes that adds more perspective to what I just discussed. This post is a part of A to Z of soft skills for #AtoZChallenge. I’m talking about 26 skills in 26 days and how to improve on them. Feel free to look around the blog for other skills I have written about so far. Do share and tell others about it too.